Burland HOA is a Colorado not-for-profit corporation that is not a common interest community under the Colorado Common Interest Ownership Act. 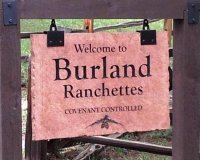 •to maintain property values and the quality of life in Burland Ranchettes and the neighboring community. We hope that visitors share these concerns and will join us in our efforts. Our meetings will be held at Shepherd of the Rockies Lutheran church, 106 Rosalie Road (same time...2nd Saturday of the month at 9:00 a.m.). Please join us.